Why Statewide Public Works Mutual Aid? Cook County Department of Homeland Security and Emergency Management has agreed to provide tuition support for credentialed members of Statewide specialized rescue teams recognized by IEMA or for first responders in the following Illinois counties: Cook, DuPage, Lake, Will, McHenry and Kane. Contact IFSI NIMS Program Manager Bob Doty with any questions: bdoty@illinois.edu. 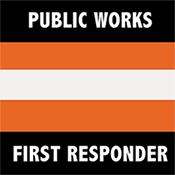 © Copyright 2016 Illinois Public Works Mutual Aid Network | Website Design by Anttix, Inc.